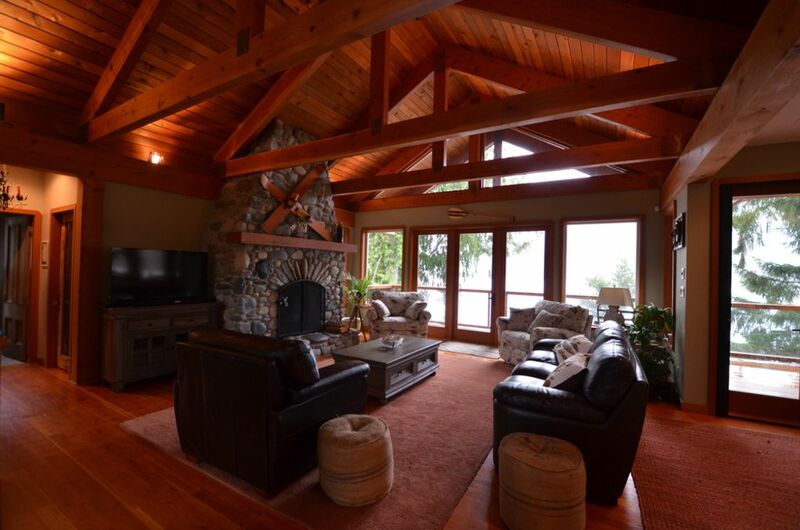 Perched above the westside of Lake Shawnigan you will find this lovely bright, spacious home with splendid views of the lake and Mt. Baldy. Walk down the path two sitting areas over looking the dock and swim area and continue on to a large dock reaching out into deep enough water for any boat on the lake. The dock is complete with covered boat parking stall. This home boasts three bedrooms each with a full bathroom, one of each located on the main entry level with only one small step into home for ease of access. The master suite which is located on the lower level is splashed with a beautiful sunrise from across the lake, thru the double doors every morning and has a queen bed, a fold-down couch, walk-in-closet and private ensuite with heated tile floor, bathtub and separate shower. Also on the lower is a large family room and third bedroom with bunkbed and single bed for up to three to sleep. The home has all the modern amentities you would expect from a high end home, including granite countertops, cable t.v., internet, netflicks access thru smart t.v. 's, dvd player, full laundry, open fireplace, and wood stove. There is also a paddle boat, and floating trampalene for water play. All rentals to be paid by credit card, full cost of booking and cleaning fee. Damage deposit is collected separately and will be returned within one week of rental ending. Minimum rental age is 30 years old, No pets, No smoking. Our family was here over the holidays. It was really short notice cause our prior plans were affected by the windstorms. Mike was really flexible and easy to coordinate with. The view from the cabin was tranquil and the house had so much space for 7 of us. The kitchen was well equipped if you want a cook out and everything was clean and modern. We would recommend it to any larger group looking for a relaxing stay. Beautiful home on the lake. Furnished with high quality. The home is beautifully furnished and maintained. The dock is large with lots of comfortable furniture and fun if you have children, which we did not and wished we had!. The upper deck is large with a table that holds six people. The kitchen is large and well appointed. Thank you, Mike.